Shell-shaped cup; dark green jade; mounted in gold and enamelled; sides with honeysuckle pattern in low relief; handles formed of contorted dragon-like figure with two arms gripping the sides; mounts chased and enamelled white, details in ruby and sapphire colours; two bands on stem and foot, all with gold scrolls on ground of white enamel. Origin: Milan or, more probably, Prague (workshop of Ottavio Miseroni), beginning of 17th century; later additions include the jade 'serpent-monster' handle and its enamelled gold mounts. Commentary: In Read 1902, and again in Dalton 1927, the cup in its entirety (including the handle) was described as “German, 16th century”, but neither the bizarre design of the handle nor the way in which it has failed to become an integrated element within the oval design of the cup permits its age and authenticity to remain unchallenged. On close examination, the quality of the carving of the handle's six sections of jade is greatly inferior to that on the cup itself. This conflict, which is a most disturbing feature, is particularly noticeable in the crude carving of the two scaly neck sections which end in a very curious feline head that has no counterpart in the repertoire of Renaissance grotesques. Equally, it may be observed that the torso lacks any true Renaissance sense of modelling, and even the double-twisted tail is mechanical and terminates in an uncharacteristically feeble, short point. Therefore, this handle seems unlikely to be original, even though some authentic Kunstkammer hardstone carvings are surprisingly less well carved than others - for example, the jasper standing-cup in the form of a bird from the Treasure of the Dauphin in the Prado, Madrid (D. A. Iñiguez, ‘Catálogo de las Alhajas de Delfín’, Museo del Prado, Madrid, 1989, pp. 56-7, no. 29, with col. pl.) or the standing-cup with a dragon's head from the French Royal Collection in the Galerie d'Apollon of the Louvre, Paris (inv. no. O.A. 37). However, such pieces are consistent throughout and contain no disquieting features, although their place of origin may be difficult to determine. No doubt the fantastic form of this handle was directly inspired by the famous gem-set and gold-mounted lapis-lazuli 'dragon-bowl', which was first listed in the Inventory of the Emperor Rudolph's Kunstkammer of 1607-11 and has since remained a greatly admired and unique masterpiece of Mannerist fantasy among the Hapsburg treasures (Kunsthistorisches Museum, Vienna, inv. no. 1851; see R. Distelberger, in ‘Prag um 1600: Kunst und Kultur am Hofe Kaiser Rudolfs II’, Kunsthistorisches Museum, II, Vienna, 1988, p. 216, no. 690, col. pl. 26, with full bibl.). Its loop handle, carved from a single piece of lapis-lazuli, is made in the shape of a dragon's long, curling, muscular neck, and its large, enamelled gold, horned head of fearsome character almost fills the upper end of the bowl as it projects forward towards the pointed lip; its golden wings, half-open, envelop the rim and upper part of the bowl on either side, whilst a small enamelled gold mount in the form of a bunch of fruit and leaves (in relief) disguises the join on the inner surface of the loop handle. Therefore, all the extraordinary features of the London jade handle could have been derived from the lapis-lazuli original in Vienna, which is now attributed to the Miseroni workshop in Milan, c. 1580. 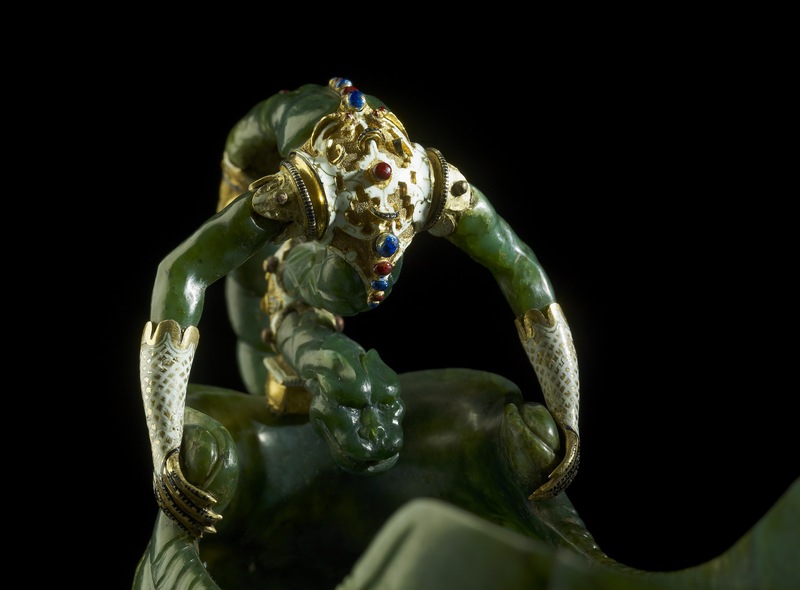 However, the jade monster-dragon is pathetically inadequate in design and incompetent in execution, whereas the lapis-lazuli original is fully integrated within a masterly, overall design; at the same time the goldsmith, who has been required to play a much bigger role, has used the softness of the gold to unite the handle and the bowl in accordance with the best Renaissance practice. Even the decoration of the enamelled gold mounts on the jade handle seems to be directly influenced by the goldsmith's work on the lapis-lazuli 'dragon bowl' in Vienna. For example, the unusual white lattice pattern on the elbow-length 'gloves' corresponds exactly with the white enamelled design on the long, tapering fold of the dragon's two wings, as each rests on an opposite rim of the lapis-lazuli bowl. Whereas the half-open wings embrace the form of the bowl with natural grace, the ungainly, clawlike 'hands' emerging from the elbow-length 'gloves' seem stiff and expressionless, even failing to clasp the scrolling rim of the jade cup in a convincing manner. Indeed, the inferior quality of the enamelled gold mounts on the jade handle contrasts with that of the mounts on the stem and foot of the London cup, which are distinguished by sophisticated design and delicate workmanship. Furthermore, the clumsy way in which the crude backs of the mounts of the jade handle are allowed to be seen - especially the various rivets and screw-heads and nuts - and so disfigure this objet-de-luxe is entirely contrary to Court standards and methods in the Renaissance. The convoluted and rather meanly conceived serpent-monster handle is not only a modern addition of inferior workmanship but is not even in sympathy with the subtle style of the jade cup itself. Whereas the Vienna lapis-lazuli bowl and its dragon mounts and handle belong to the Mannerist fantasy of the 1580s, the jade cup is part of that slightly later and more cultivated school of hardstone carving fostered at Prague under the personal patronage of Rudolph II at the beginning of the seventeenth century. Once the jade cup is freed of its obtrusive and visually disturbing handle, it becomes an interesting and exceptionally rare addition to the small group of precious hardstone vessels that have survived from the Miseroni workshops soon after 1600. The deep, almost straight-sided form of this exceptional cup, which in its curving lines almost suggests a shell-like origin, can be compared with one documented and very similar piece that has survived in the Treasure of the Dauphin in the Museo del Prado, Madrid (see Iñiguez 1989, p. 43, no. 18, col. pl.). Listed under no. 35 in the Inventory of 1776, it was then described as: “Vaso en forma de morrion”; more recently, its gemmological description as an 'agate' has been amended to 'chalcedony'. It has survived with its simple but graceful gold handle, elegantly enamelled in black and white, and with its short stem and oval foot. The latter, which are very similar to those on the jade cup, comprise a gold rim-mount and a gold collar-mount (above the carved knop), which are both elegantly enamelled in black and white to complement the handle. It seems, therefore, very possible that originally the London jade cup also had an enamelled gold handle of similar form, which would not have distracted from the clean lines and restrained decoration of the cup itself. The Prado chalcedony cup (H. 15 cm) has, by comparison, even less carved ornament, though the vigorous scrolls curling on either side of the springing of the handle, together with the decoration of the rim (on either side), provide ample evidence of a similar high standard. The London jade cup's low-relief ornament most closely resembles the decoration found on a few hardstone cups from Rudolph II's Kunstkammer, especially on the heliotrope bowl and the agate cup and cover with an urn finial - both with enamelled gold mounts by Jan Vermeyen - which have most recently been attributed to Ottavio Miseroni c. 1605 (see R. Distelberger, in ‘Prag um 1600’, I, Vienna, 1988, pp. 485-7, nos 366 and 369, with col. pl. ); however, Ottavio Miseroni, who died in Prague in 1624, continued to favour this type of low-relief decoration, and another fine example from the Hapsburg Schatzkammer has recently been dated “about 1615-1624” (see R. Distelberger, in ‘Prag um 1600’, II, Vienna, 1988, p. 236, no. 708, with illus.). Furthermore, the sophisticated style of the enamelled mounts on the foot and stem of the London jade cup corresponds with that found on the products of the Imperial Court workshops soon after Rudolph II's death in Prague in 1612 - see, for example, the jasper tankard and cover with enamelled gold mounts by Andrea Osenbruck, which was first recorded in the famous Matthias Inventory of 1619, no. 3541 (see R. Distelberger, in ‘Prag um 1600’, I, Vienna, 1988, p. 513, no. 383, with illus., where it is attributed to Prague, “1612-1618”). Therefore, once again the evidence of the mounts on the foot and stem of the London jade cup, which may also be compared with another royal masterpiece in the Waddesdon Bequest – King James I’s Lyte Jewel of 1610 (WB.167; see Hugh Tait, ‘Catalogue of the Waddesdon Bequest in the British Museum, I: The Jewels’, London, 1986, pp. 174-188, no. 33, col. pl. XXIV) - helps to confirm the proposed date of origin of the jade cup within the second decade of the seventeenth century. Finally, jade was far more rarely used than agates, jaspers and heliotropes, but both the 1607-11 Inventory of Rudolph II's Kunstkammer and the extant specimens in Vienna prove that the Miseroni workshop in Prague could fashion imaginative shapes from this stone with equal skill and inventiveness (see R. Distelberger, in ‘Prag um 1600’, I, Vienna, 1988, pp. 482-4, nos 361-3, and p. 486, no. 367, with illus.). A large, beautifully carved jade tazza, ascribed to the Milan workshop of the Miseroni (L. 25.5 cm), can be seen in the Danish Royal Kunstkammer (inv. no. 6-63; J. Hein, Versteinertes Eis. Gefässe aus Bergkristall und Halbedelsteinen des Grunen Kabinetts in Schloss Rosenberg, ‘Kunst und Antiquitäten’, I, 1985, p. 40, fig. 6), while in France Cardinal Mazarin's collection in 1661 included four Renaissance pieces of jade that by 1673 belonged to Louis XIV and consequently can still be seen in the Galerie d'Apollon of the Louvre (D. Alcouffe, The Collection of Cardinal Mazarin’s Gems, ‘Burlington Magazine’, CXVI, 1974, pp. 517-18, inv. nos 259 (fig. 21), 286 (fig. 22), 343 (fig. 22), 419 (fig. 21), where the rarity of such jade objects in these French inventories is made very evident). Significantly, three of the four have almost no carved ornamentation, though their simple polished shapes are truly impressive and no doubt the beautiful colour of the jade was their prime attraction, especially when set off by elegant gold mounts. Indeed, no plainer jade standing-cup from the Imperial Court workshops in Prague (soon after 1600) can be found than the Vienna example with the gold rim-mount delicately enamelled with lively hunting, fishing and other landscape scenes (Kunsthistorisches Museum, Vienna, inv. no. 1727; R.-A. Schütte, ‘Prag um 1600’, I, Vienna, 1988, pp. 487-8, no. 370, with three illus. ; see also, R.-A. Schütte, Mathias Beitler - Ornamentstecher in Ansbach und Hartschier in Prag, in ‘Prag um 1600: Beiträge zur Kunst und Kultur am Hofe Rudolfs II’, ed. E. Fučikovǎ, Freren, 1988, pp. 267-72, figs 2-3). Hugh Tait, 'Catalogue of the Waddesdon Bequest in the British Museum. III. The Curiosities', British Museum, London, 1991, no.25, figs. 256-258.